M cDonald's is going to be launching their annual advertising literacy program in a few weeks and this time around they're including ebooks. November is National Literacy Month in the US, and every year McDonald's has supported literacy efforts via their kid's meals. This year McDonald's stores across the US will give away 20 million books. There is going to be a selection of 4 original titles, each of which will feature McDonald's characters. It looks to me like this is almost as much an advertising effort as a literacy program, but at least the kids are reading. McDonald's is also going to partner with Reading is Fundamental (RIF), the largest children’s literacy non-profit in the U.S., which will be giving away 100,000 copies of the books to children who do not have easy access to books. Also starting next month, McDonald's plans to give away one free interactive ebook each month. This part of the program will continue until the end of 2014, and the ebooks will only be available in McDonald's McPlay app for iPad and iPhone. You might recall that I mentioned this app before; back in August the McDonald's stores in Portugal started a similar literacy program, and that program also let kids read free ebooks in the McPlay app. The interactive ebooks were developed by DK Publishing, the same firm that developed ebooks for the literacy program in Portugal. The first ebook introduces DK’s Amazing World Series, with The World’s Greatest Cities. 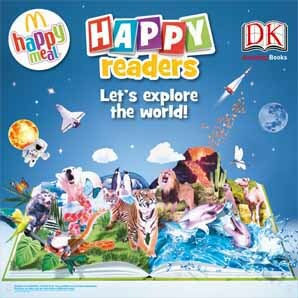 Kids will also be able to engage with an interactive digital version of McDonald’s kids meal print book, The Goat Who Ate Everything via the McPlay app.